Bathrooms: 4 "Full Bath(s): 3, Half Bath(s): 1"
Beautiful waterfront condominium! Featuring a spacious 3 bedroom, 3.5 baths, this ground floor condominium has a relaxing Caribbean feel, is fully furnished, and ready for your vacation plans or full time living. An open floor plan includes a large living area, dining area, and full size kitchen with granite counters. Tall ceilings and handmade Mahogany cabinetry and arched doors are found throughout the condo. The living space separates the Master Suite with its 2 closets and marble bath from the other two guests suites, each with their own on-suite marble baths. With its front to the waves and its back to the mangrove, Punta Caracol is a great location for those that seek privacy and peacefulness. It is nestled amongst other waterfront, luxury properties on a quiet stretch of water about 10 minutes north of the Puerto Morelos Town Square. 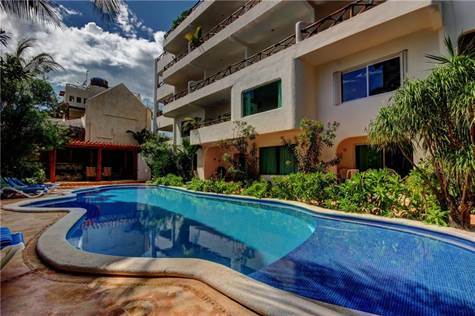 Punta Caracol is a boutique complex with just 6 units with off street parking and an onsite caretaker.